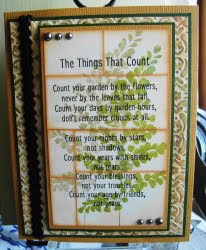 Vada's Blog Stamp Inks and Paper : The Things That Count. From the TJ. Newsletter April 2008 comes Aged Tiles. I also added alittle Cuttlebug Highlights from Nov. 2008. 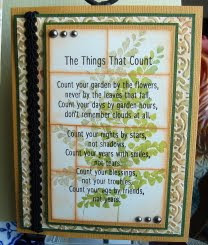 My stamps are from Club Scrap, and embossing folder from Sizzix. This is the prettiest tile piece I've seen yet!